You may not realise that you can legally invest in almost any stock market in the world. Yes, there are a few markets that don’t allow any investment by foreign retail investors. There are also a few that only let citizens or residents of certain other countries invest. And in a handful of cases, it can be illegal for citizens of one country to invest regardless of what the local market says about foreign investors. For example, US laws would prohibit US citizens from investing in Iran, even if you could open an account in Tehran. But in most cases, you can invest wherever you want. The main limitation is usually getting a stock brokerage account that allows you to trade the market or completing registrations with the local authorities that are needed as a foreign investor. Sometimes, this can be too time consuming or costly to make it worthwhile, certainly for a one-off trade. This article is an overview of where you can technically invest and how easy or hard it may be to do so. If you’re looking for suggestions about specific brokers who can trade these markets, see the international stock broker guide or search the stock broker directory. The discussion here is of where you can invest – not where you should. Many of these markets are extremely high risk, have poor corporate governance standards, limited accounting standards, are subject to a high degree of political uncertainty and many other reasons to be cautious. If you are not a investor with a great deal of experience in emerging markets, I recommend that you stick to North America, Europe and the most advanced markets of Asia only. There are no significant barriers to investing in any of the major markets of Western Europe or North America. Multimarket brokerage accounts covering the majority of both regions are easily available. The one caveat to this is that where a stock broker offers a particular country, it does not necessarily offer all the exchanges in that country. For example, most brokers dealing in the US will offer the New York Stock Exchange, Nasdaq and the American Stock Exchange. But many will not offer over-the-counter stocks. Similarly, international stock brokers dealing in Germany will offer Frankfurt-listed equities and sometimes Stuttgart, but usually not the smaller regional exchanges. And it’s hard to find firms outside Japan that will deal in Osaka-listed shares – there are some, but they tend to be more expensive. This is not usually a problem for most foreign investors. But if you have very specific requirements, ask the broker that you are considering using exactly which exchanges and stocks they can trade for you – not just which countries. In Eastern Europe countries do not generally have any formal barriers to investing, but it may be harder to find an account that will enable you to invest in a given country. Poland is by far the easiest to access. 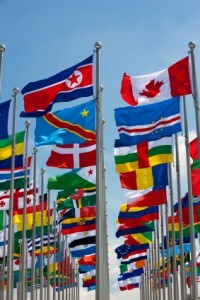 Many of the other markets have a very small number of listings and little interest from foreign investors. For example, the Prague stock exchange has just 15 listed companies. Consequently, international stock brokers rarely bother to offer Eastern European markets. Looking at stock brokers in Austria or the Baltic countries may be one way to find an English-speaking firm that can access a number of these markets for you. For Russia, brokers have told me that setting up a local account is an administrative headache, especially for individuals. However, some US-based brokers offer this market, as do a few in the Baltic states. A significant number of Russian stocks are available as ADRs and GDRs in New York and London. Most countries in Asia are happy to receive foreign investment from any source and multimarket accounts covering most of the region are readily available from stock brokers in Hong Kong and Singapore. There are a few exceptions and quirks, which I’ll run through quickly. Mainland China has two types of shares with different rules, both traded on the exchanges at Shanghai and Shenzhen. A shares are denominated in renminbi. They can only be traded by Chinese citizens and a small number of foreign institutions with qualified foreign institution investor (QFII) status. B shares are denominated in US dollars (Shanghai) and Hong Kong dollars (Shenzhen). They can be traded by all foreigners and by Chinese citizens with the appropriate foreign currency accounts. Not all A share issuers also have B shares – in fact, the vast majority now don’t. The B share market is small, contains many poor quality companies and generally sees little action. While B shares were originally intended as the main mechanism for foreigners to invest in China, most people have preferred to focus on mainland Chinese companies listed in Hong Kong, which are available to all investors. These companies fall into three groups. H shares are issued by mainland-registered companies in the Hong Kong market (so the same business could have A shares, B shares and H shares outstanding). Red chips are state-controlled businesses that are technically registered in Hong Kong, but do the majority of their business in the mainland. P chips are registered in Hong Kong, but are controlled by non-state mainland owners. All of these trade in exactly the same way. Chinese firms can also have listings further abroad, such as in Singapore (where they are known as S chips) and the US. The rules on investing in A shares are likely to be relaxed in the long term, but it will probably take a decade or more. For now, foreign retail investors are confined to the other types. Update to the following: The rules were relaxed at the beginning of 2012 and foreign individuals are now theoretically allowed to invest directly. However, the process is bureaucratic on the broker’s side and no Indian firms yet seem to be offering services to overseas retail investors. The guide will be updated when the situation is clear. By comparison, India is straightforward. The market is closed to foreign retail investors, but open to registered foreign institutional investors (FII), without the limits that apply to QFIIs in China. Consequently, individuals can only invest through Indian firms listed abroad (although high net worth individuals can sometimes take positions through derivatives known as p-notes issued by institutions with FII status). There are a number of India firms with international listings, mostly in through ADRs and GDRs in the US and the UK, although the overall quality is not high and the range is disappointing. There are limits on foreign ownership in India companies and in the case of a few of the most stocks where foreign ownership is full, the ADR can trade at substantial premium to the underlying value of the shares (HDFC Bank’s ADR in New York is ongoing example). For a Non-Resident Indians (NRI) – a person originally with Indian citizenship now living outside India – or a Person of Indian Origin (PIO) – someone whose parents or grandparents were Indian citizens – the situation is better. They are entitled to invest directly in the Indian markets if they obtain a Permanent Account Number (PAN) from the tax authorities. Any Indian financial institution that caters to NRIs will assist with this. Overall, India remains one of the most frustrating markets for foreign individuals. The rules are unlikely to change soon, although there is some discussion of allowing foreigners to invest in domestic mutual funds through feeder funds abroad. Thailand limits foreign ownership of companies to a maximum of 49%, except in the banking and finance sector where the limit is 25%. Outstanding shares are classified as foreign (F) or local (L) depending on who owns them. The status of a share can be swapped from L to F as long as the foreign ownership of a company is not full. But when the foreign limit for a company has been reached, foreign shares can trade at a premium to local shares. The stock exchange eventually introduced a solution to this – the Non-Voting Depositary Receipt (NVDR). This is the local equivalent of an ADR, giving the foreign owner rights over local shares held by the stock exchange on his behalf. The NVDR holder is entitled to all dividends and rights issues, but cannot vote, thereby doing away with concerns over foreign control. Because NVDRs and local shares are interchangeable without limit, there should be no premium on NVDRs. On most systems, Thai shares are quoted with a suffix of –F, -L and –R depending on the type. As a foreigner, you should buy the foreign or NVDR shares, depending on relative price and availability. Your broker may well take care of all this for you seamlessly, buying what’s available depending on your status. If you accidentally buy local shares, you will not be entitled to dividends or rights issues unless you convert them to foreign status. This may not be possible depending on foreign limits, and in any case could be an administrative hassle for an overseas shareholder. Malaysia has some foreign exchange restrictions that can lead to a bit of extra paperwork when opening an account that can trade there, even with a broker outside the country. You will usually need to declare that you are not a Malaysian resident and open a personal nominee account with the local securities depositary, which records the ownership of all shares. This involves completing a couple of simple forms and paying a nominal fee (Singapore brokers typically charge S$5). Your broker will assist with this and brokers in Singapore and Hong Kong routinely include the forms in their account opening procedure. Korea and Taiwan have some issues regarding free conversion between foreign and local currencies. In addition, Taiwan requires trades to be prefunded – the funds must be onshore before the trade is made, rather than being remitted to Taiwan afterwards. As a foreign retail investors, you don’t deal with this problem directly – your broker takes care of it. But you will see the indirect effects. Firstly, foreign brokers offering these markets will typically require you to settle in US dollars (or another global currency) rather than offering the option to hold cash and settle in won or Taiwan dollars. Secondly, these frictions mean that Taiwan and Korea are less commonly offered than most Asian markets and may be more expensive to trade (although they are readily available in multimarket accounts with Hong Kong and Singapore brokers). Vietnam is open to foreign individuals, but you need to open a local bank account and obtain a unique trading ID that is then linked to a specific brokerage account. I understood that it was still necessarily to go to Vietnam to do this in person with a local firm, but Polaris Securities in Hong Kong is now apparently offering trading in the Vietnamese market. I have yet to use this service or speak to anyone who has, so have no idea to what extent they have managed to ease these administrative requirements for new accounts. Vietnam also has limits on foreign ownership of companies. In these case of its most highly regarded firms such as Vinamilk and Sacombank, this limit is full and at best a few thousand shares will trade each day, selling at a premium to the official market price. Mongolia is an increasingly popular topic at present owing to its abundant natural resources and favourable position near China. There are no limits on investment and some local brokerages advertise services in English. Major institutions are not yet investing in Mongolia, because there are no global custodian banks with offices there to hold securities on trust for them, as their rules demand. This is not a restriction for the private individual – but it should warn you how rudimentary the financial infrastructure is and how at risk your investments would be in the event of a brokerage collapse or fraud. Bangladesh and Pakistan are accessible, but will probably require local brokerage accounts – there seem to be no international stock brokers offering them yet. Rules in the Middle East and North Africa vary greatly. There are no restrictions on foreign ownership for stocks listed in the United Arab Emirates, for example. On the other hand, in Saudi Arabia shares can only be held by citizens of members of the Gulf Cooperation Council. There isn’t even a foreign institutional investor system, although institutions can now enter into swaps with Saudi Arabian banks to gain exposure to the market. You will struggle to find multimarket accounts covering many of these countries, but there are a couple of suggestions in the international stock broker list. African markets are generally accepting of foreign investors, although finding a broker for most countries may be challenging. You will probably need to look for a local firm, with all these risks that brings in a weakly regulated market that you don’t know well. However, many African markets are extremely small and illiquid. Shares may trade rarely and some bourses are only open a couple of days a week. Getting accurate information and research on firms is especially challenging in Africa compared to almost anywhere else in the world. Obviously, there are exceptions such as South Africa, which is a significant and well-developed market and the easiest of all the African markets for foreign investors to access. One major barrier to investing in most of South America is the language barrier. In contrast to most of the world, where financial services are often available in English, this is less common in the region and a command of Spanish (or Portuguese for Brazil) would be very helpful. This applies both to finding a broker and doing research. Brazil is open to foreign individuals, but local rules require your broker to identify the final beneficial owner of each transaction – this means that each foreign investor must be registered with the local authorities. There are a handful of international brokers who offer stock trading here, but they are expensive. I have spoken to Brazilian stock brokers who tell me they may be able to open retail accounts for foreigners, but they sound unenthusiastic and suggest using ADRs of Brazilian firms in New York as an easier route. I understand that many other markets such as Chile and Peru do not impose many restrictions. If you speak Spanish, it should be easy to find a broker; I have not yet located one keen to offer services in English. My knowledge of markets in Central Asia is very limited, but I suspect that it’s very hard or impossible for foreign retail clients to trade these markets without local language skills, knowledge or connections. I am aware of one investment bank that offers English-language brokerage in Kazakhstan, Kyrgyzstan and Uzbekistan – but the minimum account size for individuals is around US$250,000. However, a small number of companies have ADRs and GDRs available.